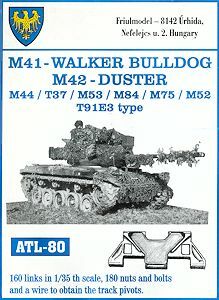 This set of individual T91E3-Tracks from Friulmodel was released awhile back but is still perfectly applicably to the newly released AFV Club M42A1 Duster. 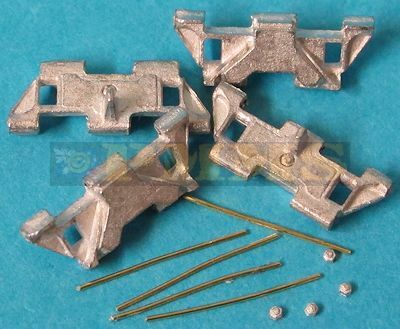 The set consists of 160 white metal links, 180 small track pin bolts and the usual coil of 0.5mm brass wire to cut up for the track pins plus a small instruction sheet showing the pin bolt assembly. 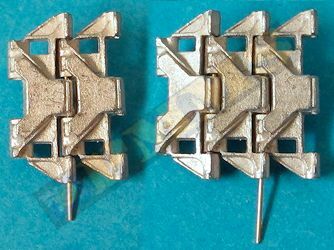 The actual T91E3 track links are 21 inches wide with a pitch of 6 inches (the pitch is the distance between the track pin centre lines), this equates to 15.24mm and 4.35mm respectively in 1:35 scale. The kit links are 15.1mm wide and pitch of 4.4mm to be basically spot on in size with just a difference of 0.14mm in width that is really not worth bothering with. 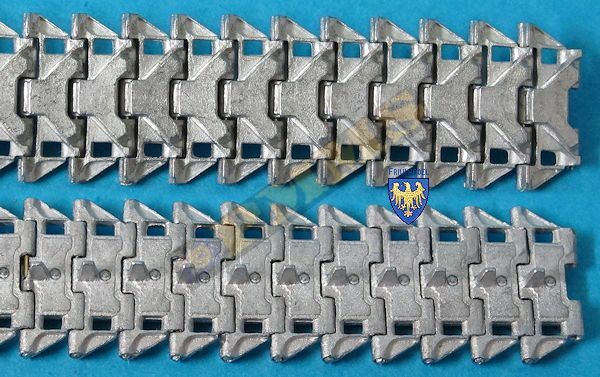 The links are nicely cast with good link details that includes the track pad although the inner track retaining bolt is included is not that well defined. The is a fair amount of cleanup required with small pour burs to be removed, the amount of clean-up differs between links with some requiring more clean-up than others. The track pin holes as with most Friulmodel sets will need you to use a 0.5mm drill to fully open up the pin locating holes which does add to the clean-up process, you should set the drill bit into your pin vice with only 13mm of the drill bit exposed so you don't drill all the way through the links. This is not the full width of the link but ensures there is clearance for the separate pin bolt to be added. 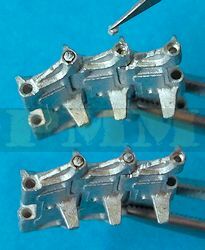 It should also be noted that as the links are not handed the separate pin bolts are on the inside of the left track run and the outside of the right track run with a cast in pin bolt on the other side of the links. including the chopped up 13mm lengths of wire and small pin retaining bolt heads. 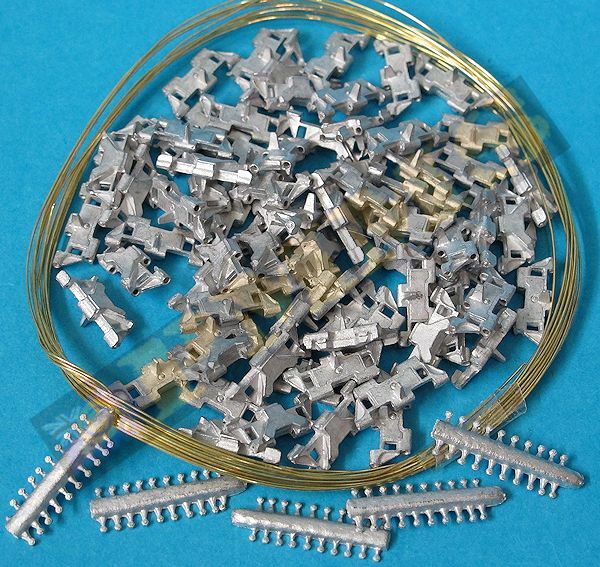 The most time consuming part of the assembly is the link cleanup, the drilling out of the pin holes, the cutting of the wire pins and cutting the small pin bolts from their runners. Cutting of the 13mm track pins is best done using a steel ruler as a cutting board so you cut (using a #11 blade) each pin to the exact 15mm required and also when cutting away the small bolts, cut towards the bolt so as not the leave any edge as there is not a lot of clearance when fitting the bolts into the track end recesses. Once the preparation is done the actual track assembly can begin and it's quite straightforward really by fitting one link into the next and inserting the wire pin and then adding the pin retaining bolt secured with a dab of thicker cyanoacrylate. You may wish to join all the links to form the complete track run and then add the retaining bolts in separate sequences to get once into a rythem. 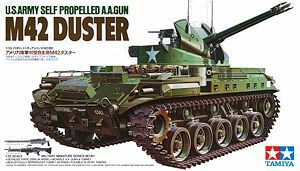 The assembled track runs are extremely robust being metal and articulate freely allowing easy fitting to the target kit. 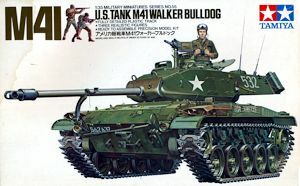 The actual M41/M42 uses 75 links per track run and you will need to use only 74 kit links to get the correct track tension when fitted to the kit, this 1 link difference is probabaly due to the small difference in track pitch and the extra "play in the track join but is of little consequence and is not at all noticeable with the track runs added to the kit. 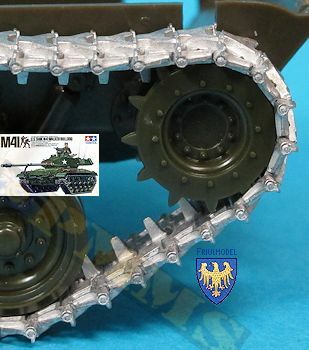 The tracks fit nicely to the AFV Club M41 and M42 kit drive sprockets although the it was a little tight and you may have to fit them over the drive teeth with a little force but once in place the fit was good. The actual track is "live" meaning there is tension on the link joins and the track will curl up on itself when not fitted to the vehicle, this also means there is no appreciable track sag between the top return rollers as is seen with "dead" track used on WWII German and most Soviet tracked vehicles. 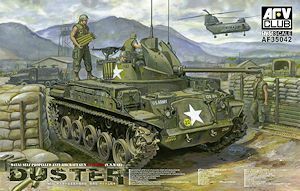 I also test fitted the track to the older Tamiya M41/M42 (re-issued kit) drive sprockets and again the fit was good should you wish to use the tracks on these kits. 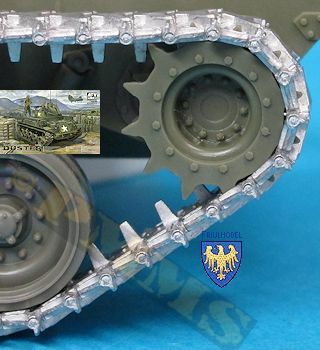 Track links fitted to AFV Club M42A1 Duster kit suspension. 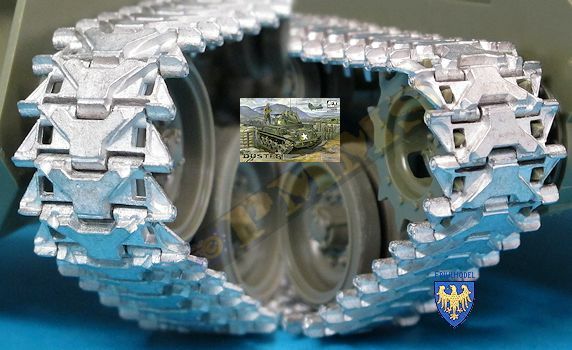 Track links fitted to Tamiya M41 drive sprocket showing good fit. 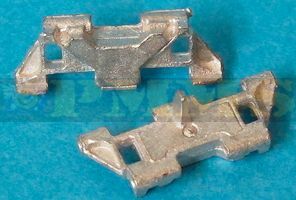 This set of metal tracks from Friulmodel is nicely detailed with good track link definition and has the usual cleanup required for the links prior to assembly although there is the usual Friulmodel requirement of drilling the pin holes and cutting the wire for each track pin. 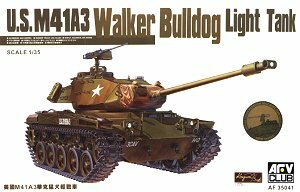 The assembled links are accurate, robust and articulate very well although there is no requirement for track sag on the M41/M42 kits they do make a nice update to the target kits appearance if you prefer metal track.